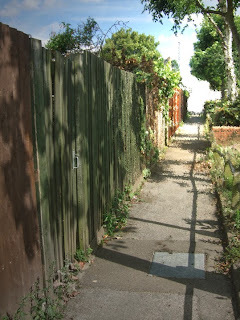 There was a shimmering in the air in the allyway that ran between the back gardens behind the houses. It beckoned like a rent in the fabric of reality offering a portal to a world that was larger, more exciting than this one; somewhere where the colours were brighter, like somewhere over the rainbow, or where Narnian adventures might be had. But I knew it was just a heat haze caused by the sun on the tarmac. And it was getting late in the afternoon; the time for adventures – even adventures of the imagination – was slipping away. I was 11 then. It was the end of August, nearly the end of the long summer holiday before I went to the new school. And I was old enough to realise that adventures like that don’t really happen, and that heat hazes are similar to those desert mirages that promise wonders to parched travellers, but only lead to dry sand. That was a long time ago, but that image is still clear in my memory. More vivid than anything else from that sunny summer at the end of childhood. And I do wonder if I should have walked down that alleyway and followed the grey tarmac path through the shimmering air, to find a world that was larger, brighter, more exciting than one where science rules; a world where the imagination could create wonders for everyone and not just the very young. The photo shows a different alley, in a different time, with added effects.